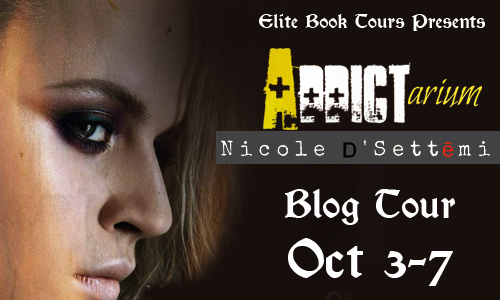 Welcome to my tour stop of Addictarium by Nicole D'SettÄmi. The tour runs from October 3-7 and you can follow the tour here. When creative spirit, and inhabitant of bohemia--Danielle Martino--starts to lose her eyesight from shooting a poisoned bag of heroin, she flees to New York City for surgery, and then to rehab. However, the two-year intensive drug recovery therapy program is more intense than anything she could have anticipated, and Danielle finds herself searching for purpose, sanity, and sobriety in this âaddictarium,â--or as she likes to call it; a house of broken souls. "Come on, Danielle!" Karen shouted over the raging winds, which were both loud and aggressive, due to April's unpredictable weather. We were scurrying down the wooden planks along the boardwalk, five minutes from our community. Karen, who was drenched in a thick, mauve turtle neck, and a pair of furry, suede boots, ran awkwardly about two feet ahead of me, her left leg shorter than the right making her look funny. She laughed loudly, nearly tumbling over, her voice ringing through the air, despite the howl of the heavy winds. I followed, out of breath, trying to inhale the last of a cheap, fat menthol cigar. Black-and-Mildâs, the box said, and they were delicious. Strong, and intense, scorching the back of my throat, just the way I needed something to be. We continued to run, as we laughed even harder. Tear drops were streaming down my face from my watery eyes, with the sun luminous and bright, but the weather still quite cold, at least for spring. Nicole D'SettÄmi is a 34 year old creative writer, poet, and artist from Niagara Falls, New York. Born in a tiny town bordering Canada only five minutes from the legendary falls, Nicole says she had an eye for beauty at a young age, and that included poetry. She can remember from an age as young as six, being selected as part of the cityâs "young authors club." She was interested in lyric poetry from the time she was a pre-teen into her early-to-mid-twenties, and moved into creative writing and fiction in her late twenties and early thirties. In April of 2010, Nicole lost 95% of her eyesight due to a poisoned bag of heroin she had injected, and was shipped to Manhattanâs Bellevue hospital 1,600 miles away from her city at the time, which was in South Florida, where she had been attending an art institute for photojournalism. She was forced to drop the courses, as she began a new, sober life in New York City. Nicole was also separated from her fiancÃ© and co-conspirator in 2010, while recuperating in Daytop Village. At that time, she was introduced to her current fiancÃ©, who is also mentioned throughout the novel as the substance abuse counselor she fell in love with. Today, both artists run a modest business creatively assisting others, and continue to hone their fine arts abilities, in their art studio and living quarters, residing in Pleasant Valley, New York. With their creative assistance-based company; LCDS Creative Services, theyâve dedicated a division to publishing novels, named; The Book House of Seviles. They look forward to venturing further into the writing and publishing world, in 2017. 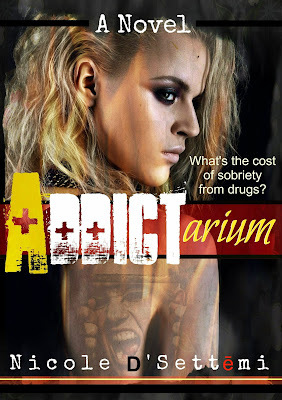 Prize #2 - A $10 giftcard for Barnes & Nobles, and a signed photo-card of "Addictarium"
Prize #3 - A free ebook of their choice on Kindle (not to exceed $9.99 for the ebook) and a signed/framed photo-card of "Addictarium"